So, it's that time of year again. Time for the annual Cycle Chic Calendar. This year we've chucked in 13 months - from Dec 2011 to Dec 2012. If memory serves, this is the fourth year in a row we've published a calendar. Thanks for all the emails asking about when the calendar would be coming out - we've been a bit behind schedule this year - but we're pleased to launch it today. It's available over at Lulu.com. We'll be explaining all about what The Cycle Chic Republic is in the coming weeks. 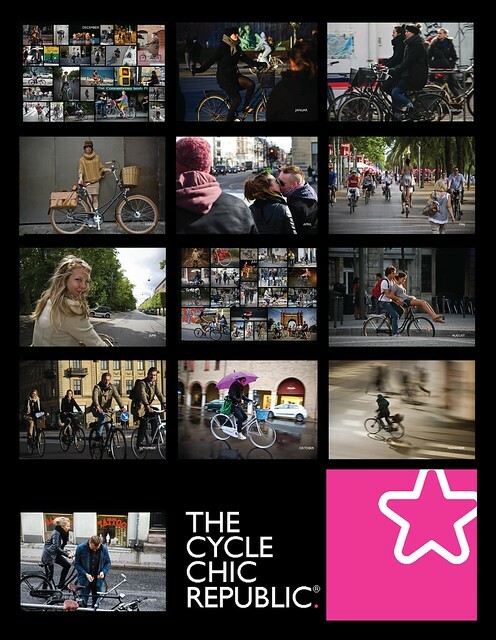 We're looking forward to sharing it with you - all of us international Cycle Chic bloggers. It looks lovely but it seems a bit pricey. Dang! Love the calendar, but I wish it weren't almost $40.00. It'd be a great present for each of my siblings, but i can't afford $40.00 a pop! every year it's hard to select the photos, believe me! regarding the price, it's always tricky finding a price to suit the global market. but we've stuck to this ballpark price for three years now. Well I disappointed, guess since there is no pic of AK I'll just have to pass, dang!